Every cocktail book has its selling point. Some try to cram in as many recipes as possible. Others list classic cocktails and cite the drinks’ original recipes. And still others play up a certain aspect of drinking. Case in point, on a recent weekend trip to Buffalo I came across a book called “High Heels and Highballs.” I almost bought it. I’m a sucker for cocktail books and an even bigger sucker for gimmicks. It’s no surprise then that I had to download this book as soon as I saw it. Sure, iBooks was selling it at a discounted price, but had I come across it elsewhere, I’m sure I still would have given it a chance. Not only am I a sucker for gimmicks, but I’ve got a passion for old-timey cocktails (and not only that, but retro pulp and detective noir type ne’er-do-wells). There’s none of that last bit in this book though, and that’s fine. There are plenty of old-timey (and classic) drinks, but the old men in the book are more of a blue collar nature — not the down-and-out yet beloved literary types I’m more fond of seeing in print. 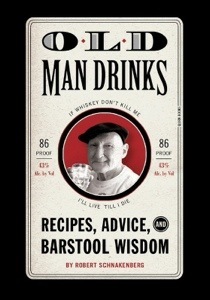 The cocktail recipes in this book are broken up with pictures of hard-drinkin’ old men whose quotes run from comical to sad to just plain nonsensical. I won’t get too critical of the “old men” in this book. They’re there to provide some color. I understand that. Their contribution though isn’t so much advice and barstool wisdom as it is little snippets of their lives. More times than not, the “old men” quotes sounded more like snippets of things overheard in a bar than advice or barstool wisdom. There were a few gems that shone through though, yet even they were more like cute little catch phrases than what I’d expected from the title. The text of the book is written in the same sort of “salty old dog” style as the old men’s quotes, but the actual written part of the book does it to better effect. As with any cocktail book though, it never hurts to double check the recipes printed with other sources. This book, for instance, says to shake a Manhattan and credits Col. Joe Rickey with the gin version of that drink. I’ve always read that you should build” Manhattans and read that Rickey’s first Rickey was whiskey-based. Still, even with little red flags like those, this book was still a worthwhile read and a welcome addition to my shelf.